Pancake Day or Shrove Tuesday is one of my favourite days of the year, it's a day where it's acceptable to eat as many pancakes as you like - what's not to love about that? As Emil and I both work during the week, we're not sure how much time we'll have to make pancakes on Tuesday, so we decided to go out for brunch and have an early pancake day instead. I recently blogged about my trip to The Pear Tree at Greenland Place and they very kindly invited me back to try their updated Banana Buttermilk Pancakes. Therefore, we thought this would be the perfect opportunity to get our pancake fix ahead of Shrove Tuesday, I tried out the new Banana Pancakes and Emil had his favourite - the Blueberry and Bacon Buttermilk Pancakes. As always, the food was delicious. The updated Banana Pancakes are topped with walnuts and a whole caramelised banana (as opposed to just the half like before), as well as maple syrup and vanilla cream. The pancakes are so light and fluffy which means they're really not heavy on your stomach, I'm so pleased they updated the pancakes as I'm now even more in love with them. Emil loved how crispy the bacon was on his pancakes and loved how well it went with the sweetness of the blueberries and maple syrup. 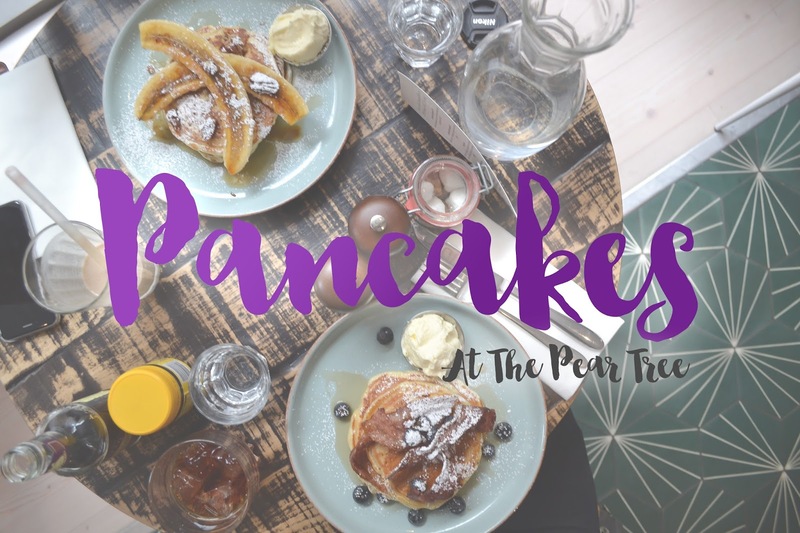 The Pear Tree actually have a special pancake menu on Shrove Tuesday (28th February) and they have so many different types of pancakes (as listed in the photo above), so there's something for everyone. If you're in the area on Tuesday, I really can't recommend it enough - I could quite easily work my way through the whole menu! Even if you can't make it on Tuesday, but are ever in the Surrey Quays / Canada Water area, I really recommend you pay this restaurant a visit. The food is amazing, there's a large variety of drinks (my favourite is the banana, peanut butter, raw coca and almond milk smoothie), the staff are all really friendly and it's so reasonably priced! You HAVE to check it out (I've left all their links below). What are your plans for Pancake Day this year?